Summary: Everybody knows Cate Cahill and her sisters are eccentric. Too pretty, too reclusive, and far too educated for their own good. But the truth is even worse: they’re witches. And if their secret is discovered by the priests of the Brotherhood, it would mean an asylum, a prison ship—or an early grave. Review: Historical and Fantasy in one magical book; what more can a girl want? I loved Born Wicked and I am kicking myself for waiting so long to read it. 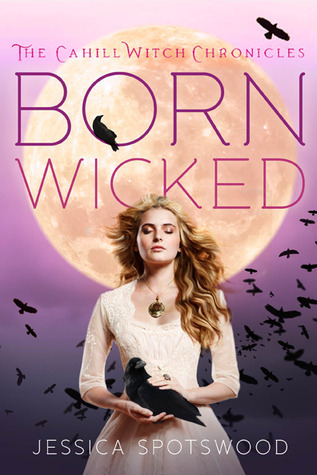 With magic, secret societies, prophesies, and romance Born Wicked has something for almost any YA lover. It is a fantastic debut that really shows off what Jessica Spotswood can do. I liked most of the characters in this book, even the ones that I thought I was not going to like I started warming up to by the end of the book. I liked how different all three sisters were, even if Maura drove me mad, they each had their own goals and motivations but thy were tied together as a family. I thought the family dynamic was illustrated very well. As the story went on the plot got even more twisted and complicated but I never got lost or felt like I was being info dumped on. I cannot wait for the next book to see where Cate's decision takes them! I recommend this book to everyone but especially people who loved Marissa Doyle's Betraying Season, and Bewitching Season, and if you haven't read them pick them up as you wait for the second book in the Cahill Witch Chronicles. I quite liked this one, though I didn't completely love it. I still need to read Marissa Doyle's Betraying Season - I only read the first book.